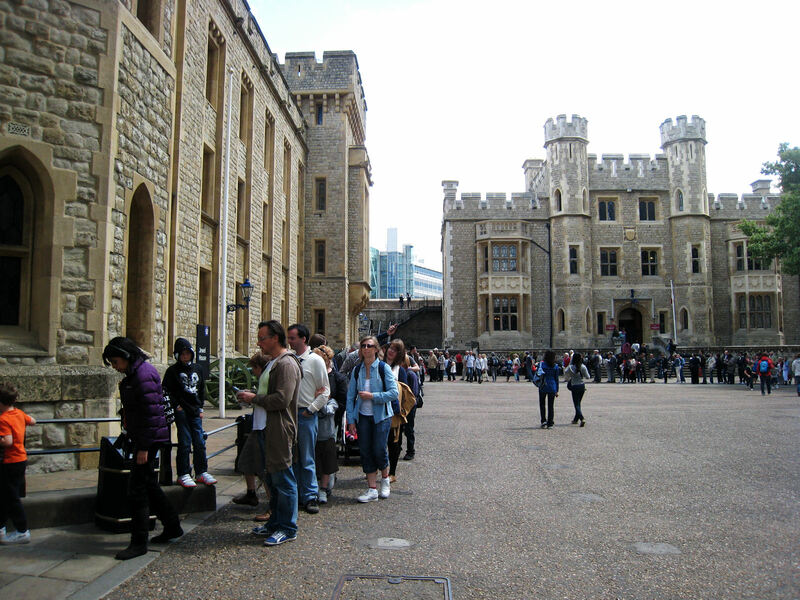 A historic castle on the north bank of the River Thames, the Tower of London is actually a complex of buildings within outer fortification walls. One of the most visited sites in London, the tower has a 900-year history of serving as a royal residence, prison, armory, and other functions. Perhaps the most popular exhibit at the Tower is the Crown Jewels, which have been on display here since 1669. Although we don't doubt their spectacular attraction, this collection of crowns just wasn't enough to tempt us to wait in a line of several hundred people today. We did have an interesting conversation with one of the Beefeater guards about the ravens which we saw on the Tower grounds. According to legend, when the astronomer of King Charles II complained in the late 1600s that ravens were interfering with his observations of the stars, the king ordered all the birds destroyed. Later after hearing a prophecy that both the Tower and his kingdom would fall if there were no ravens at the tower, he changed his mind. 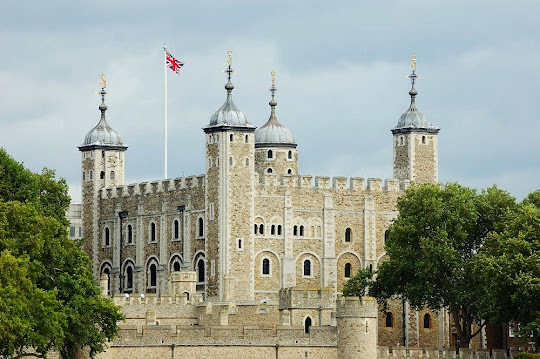 Not only were the ravens allowed to remain, Charles issued a proclamation that no fewer than six ravens would always be in residence at the Tower, an edict which is still in force today. In fact, the birds' wings are clipped to keep them from flying away. 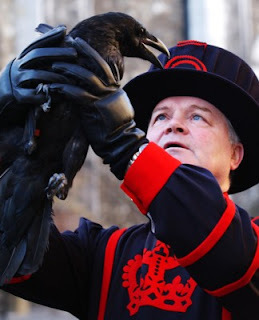 Some of the ravens are bred at the tower while others come from rescue centers. The birds can be approached and handled by the Yeoman Ravenmaster. Ravens mate for life and guard their territory fiercely. One of the largest-brained birds, raven have the ability to "speak" and live long lives. One of the oldest ravens in the Tower's history, "Jim Crow" died in the 1920s at the age of 44 years. A special burial site for the ravens lies within the walls. From the tower, we had a great view of the Tower Bridge. 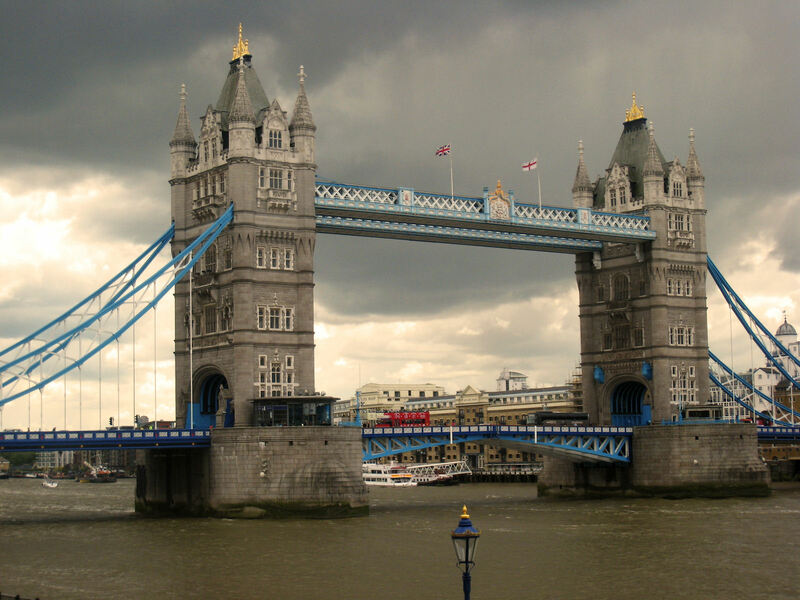 Located near the Tower of London, from which it gets its name, the bridge has established a role as one of London's iconic symbols. Built in the late 1800s, the bridge was designed to enable tall-masted ships to access the London port facilities. 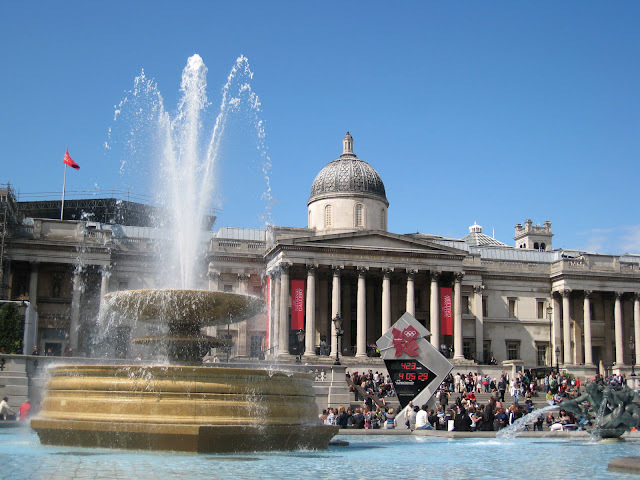 The notion of London, a city 40 miles inland from the English Channel, as a port was a concept that took us by surprise. We were quite startled when we walked around a corner and stumbled upon St. Katharine Dock, which dates back to 1125. Though the docks once handled the world's most valuable cargoes, trade ships eventually grew too large for the docks. 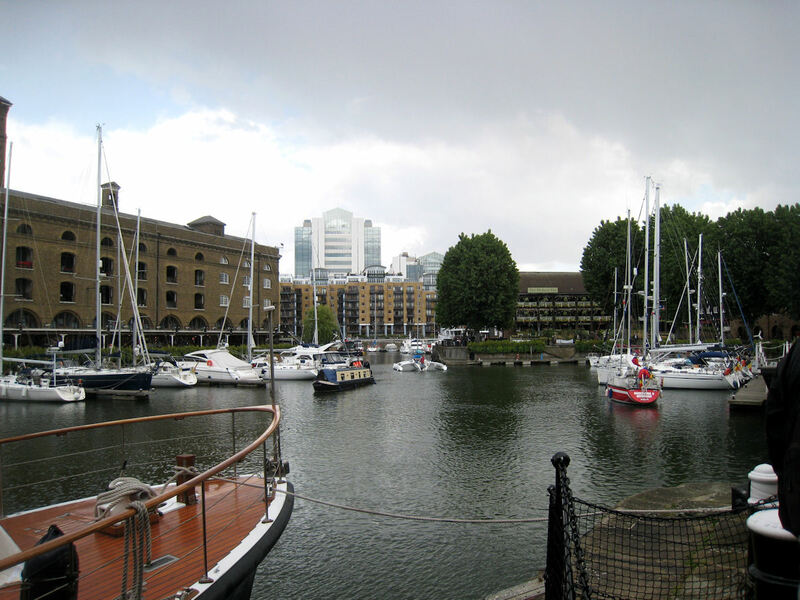 Nestled in the heart of the City of London, the marina today houses up to 200 luxury yachts and historic barges and provides space for private and corporate events. One last stop on our must-see list was Trafalgar Square, which we hadn't visited since 1989. 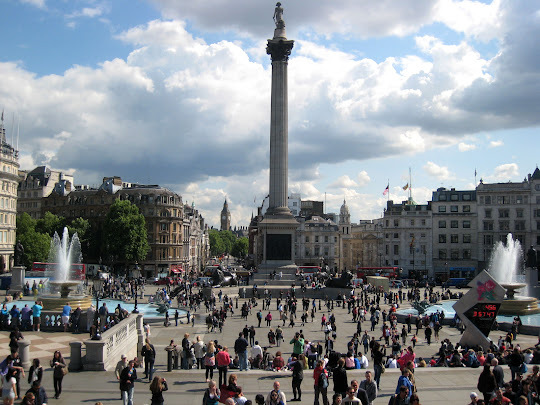 Trafalgar Square is the center for national rejoicing and assemblies and rallies for various causes. Located on the former site of the Royal Mews and stables dating back to the 13th century. The present square was laid out between 1840 and 1845 by Sir Charles Barry, the architect of the Houses of Parliament, whose clock tower can be seen from the square. 14th to the 20th centuries. We capped off this very interesting, though not restful, day with a performance of Noel Coward's Blithe Spirit at the Apollo Theater, just a short block from our hotel. Though it wasn't unforgettable, this was a very good production with superbly cast actors and enough laughs to keep us happy. Tomorrow we fly home to Georgia. When we looked at the weather forecast for tomorrow, we were shocked to see 97 degrees for a projected high. That will be an increase of about 30 degrees for us, but it's not as if we can do something to change the forecast. No point in sweating it.